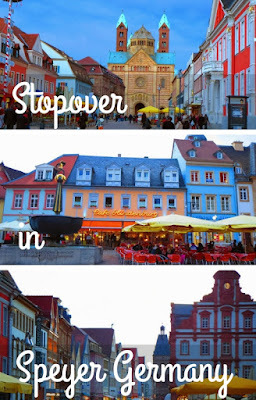 It's possible to visit Speyer as a stopover on a day trip between Frankfurt and Heidelberg. We boarded the S-Bahn train in Heidelberg and within an hour were in Speyer. It was about a 15 minute walk from the train station to the old town. Speyer Cathedral anchored one end of the pedestrian shopping street. Even though it was Sunday, many of the shops in Speyer were actually open, even up to 7-8 pm! This was a total surprise for a German city! We admired our surroundings in the fading light. We could see Speyer's clock tower anchoring the other end of the shopping strip. We stopped at a local vendor to pick up an enormous German pretzel. Yum! We walked up to the Speyer Cathedral and took a moment to admire it both outside and in. The decorations inside Speyer Cathedral were quite sedate and sparse. I loved these little flourishes on the outside. Back outside, we walked through Old Town Speyer, soaking in the ambiance. Speyer seemed to glow as the lights came on in the evening. We found a local wine pub tucked away on a back alley and stopped in for a glass of German vino. The inside of the pub was dark and charming. After dallying a bit too long over our glass of wine, we hurried back toward the Speyer train station for our timed return to Frankfurt. However, I couldn't help crossing the street to check out this statue in the front of this building. Unicorn! This definitely confirms that it was a magical day trip to Speyer. We arrived at the train station in Speyer with a few minutes to spare and were whisked back to Frankfurt for a good night's sleep. 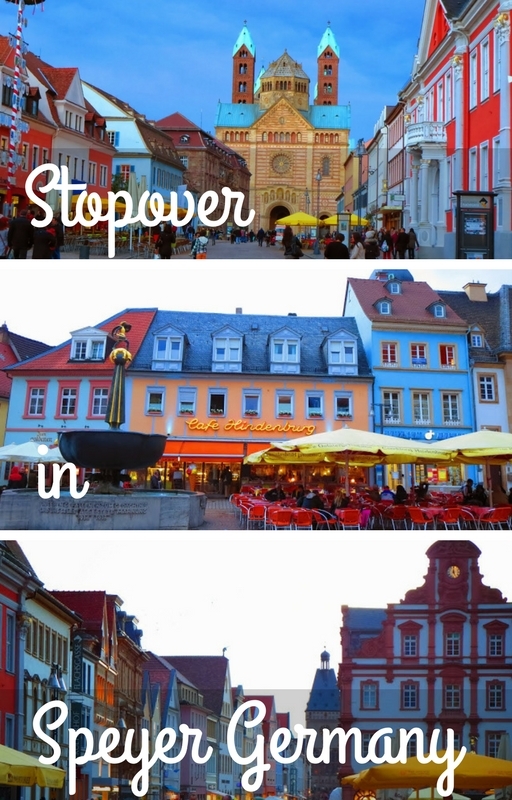 Explore Speyer, Germany as a stopover on a day trip between Frankfurt and Heidelberg. A photo-rich post by travel blogger, Jennifer (aka Dr. J) from Sidewalk Safari).